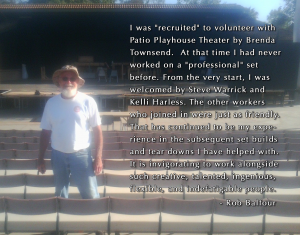 Patio Playhouse is always eager to add cheerful and motivated volunteers to our ranks. We are an all-volunteer organization, so everything that running a theater entails is a task you could be doing: building sets, marketing, fundraising, costuming, stage management, running lights, judging, cleaning the kitchen, finding props, writing press releases — it’s a very long list. Whether you want to learn the demanding and whirlwind job of Producer, or just want to sell concessions once a month and see shows for free, we welcome your participation. If you are interested in volunteering with Patio Playhouse and joining our family of theater-loving people, email our volunteer coordinator: volunteer@patioplayhouse.com or join our Volunteer Group on Facebook. 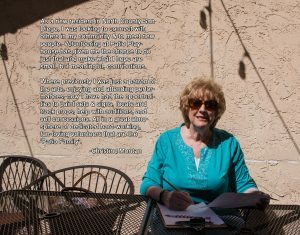 This is a place for Patio Volunteers to meet and find ways they can help the theater continue to be a thriving, positive influence in the community.